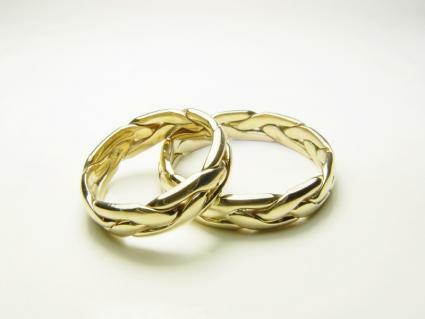 Scottish wedding rings are perfect for a couple with a Scottish heritage or who simply have a passion for the country. Scottish rings make attractive wedding bands for both men and women. They are often available in sets of matching bands which means that both rings complement each other. This is an extra-special way for a couple to demonstrate their commitment to one another. Celtic knots: The Celts were an ancient people who were known for their fierceness and their beautiful artwork. One of the most important Celtic symbols is the Celtic knot. This design is usually created with a single line and has no beginning or end, making it the perfect symbol for a marriage. Many Scottish wedding rings feature Celtic knots surrounding diamonds. The Celtic knot bands from Linda Clifford are elegant examples, available in several metals and with or without diamonds. Scottish thistle: Another powerful symbol of Scotland is the thistle. Some Scottish wedding bands are embossed or engraved with this design, which is Scotland's national emblem. The thistle ring from Gretna Green, with the symbol hand struck in the band, is an example of this design. Luckenbooth: The Luckenbooth is an ancient Scottish symbol traditionally used in brooches. These brooches were often given to loved ones, and they frequently featured an engraved message: "Of earthly joys, thou art my choice." Although not as common as other styles, the Luckenbooth is featured on some Scottish wedding rings, like the gold or sterling Luckenbooth ring from Baxter's Jewelers, and it makes a perfect symbol for a happy marriage. If you live in Scotland, it may be relatively easy to purchase traditional wedding rings; however, if you live elsewhere, you'll need to do a little more work. Gretna Green Wedding Ring Company: Located in the UK, the Gretna Green wedding company carries a wide variety of Scottish ring styles, including both thistle and Celtic options. The company offers free shipping to customers in the United States, Canada and Australia, in addition to those located throughout the UK and Ireland. Scottish Gold Collection: If you are looking for authentic rings handmade in Scotland by a local goldsmith, this jewelry retailer is an excellent option for you. David Milne makes each of the company's rings himself and all of his designs are hallmarked. A wide variety of options is available, and rings can be shipped internationally. Linda Clifford Scottish & Irish Merchant: This retail source is based in the U.S., in Maine, but specializes in Scottish and Irish goods. The company offers an extensive selection of Celtic and other styles of Scottish wedding bands. Scottish Heirloom Jewelry: If you or your betrothed is from a Scottish clan, this is the ideal place to look for wedding rings and other jewelry items that bear your clan's crest. International shipment is available. Design Bands: Based in California, this U.S. jewelry source carries a lovely selection of Celtic and Scottish ring designs in both white and yellow gold. Design: Many rings of this type have a strong Celtic theme. When picking a Celtic wedding ring it is important to pick a design that is suitable for everyday wear. Very ornate designs many not be practical. 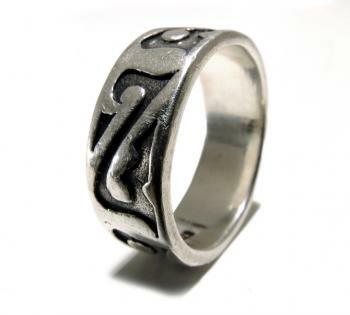 Metal: Scottish rings are either carved or cast in precious metal. Over time very soft metals such as high carat golds can wear away, particularly when worn with other rings. It is therefore a good idea to talk to a jeweler about the best metal for your ring. Gemstones or diamonds: Couples may like wedding bands that contain a diamond or gemstone. This feature is widely available in many Scottish designs. Many people do not realize the Scottish Highlands have a variety of valuable natural resources, including gold. In the 1960s, the British Geological Survey discovered gold in the Highlands, but the price of gold was not high enough in subsequent decades to make the mining venture pay off. These days, higher gold prices have finally made it profitable to mine this Scottish gold, and you can have your wedding ring made with this native material. Scottish themed wedding rings can be a stunning choice and are a great alternative to traditional plain wedding bands.